I Read Stuff! : Team Who? A friend of mine works at a pretty big company. A company large enough to have a 'corporate environment'. Corporations like this love team building exercises. Sometimes those exercises are lame and disgraceful, other times they are highly entertaining. Last weeks team building exercise was a Kickball game. A team building success I would say. The team my friend is on decided they were going to get team t-shirts made. They delegated the task to someone and waited for the Friday of fun. Well, the person in charge of t-shirts is in charge of what is on the t-shirts. A more powerful position than I think anyone really knew. ha ha ha ha ha!!!!!! 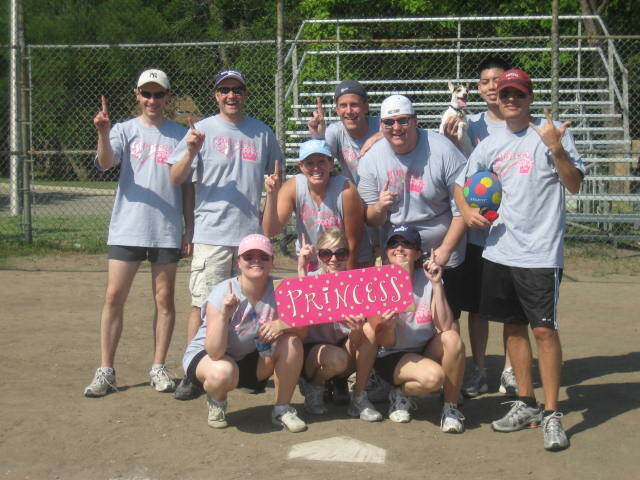 I can just see "Team Princess" playing with all the Lawrence kickball hippies. 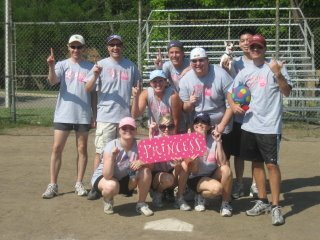 Unfortunately Team Princess did not win. Their defeat means that today the guys are wearing ties and the girls are in pantyhose.